Is it harmful to listen to music with headphones? Earplugs were designed to protect the hearing of workers in a production environment with a high noise level. However, these devices are used happy and at home, where he lacks loud noises even at night. In addition, for diving are issued earplugs that protect the eardrums from pressure changes. Ear plugs are soft plastic liners that are inserted into the ear canal and seal them tightly, protecting the eardrum from sound vibrations. For the fabrication of these devices using natural and synthetic materials: cotton, silicone, wax, polyurethane, polypropylene, PVC. The inventor of earplugs can be considered the cunning king of Ithaca Odysseus, who ordered to pour the wax in the ears command your ship, the sailors did not hear the seductive singing of the sirens, rushed into the water. Protective liners can be disposable and reusable. It should be noted that usually the ear plugs dampen the sound vibrations of low frequencies that are considered most harmful to health. For professional musicians produced liners for the ears in the form of Christmas trees, which are equally successfully muffle the sounds of different frequencies. Disposable ear plugs from grease repellent polymer is required to roll out between your hands, giving them the form of a thin cylinder, then inserted in the auditory canal. Ear expands to fill the volume. These ear plugs are good at absorbing sound, if them tightly into the ear. Otherwise, the efficiency of their protection is reduced. Also available molded ear plugs reusable. They are used with silicone, plastic or rubber. In pharmacies, these devices are sold in a sealed package. Need to find ear plugs to fit ear canal, which may be different even in the same person. If the size is chosen incorrectly, the plugs will pass through the noise or to bring discomfort to the owner. In manufacturing it is convenient to use earplugs on the wrap or on the line. Such devices can be worn around the neck or on the head and insert into ears in case of need. However, the earplugs of this type decreases the fit to the ear canal and, consequently, the level of noise reduction. 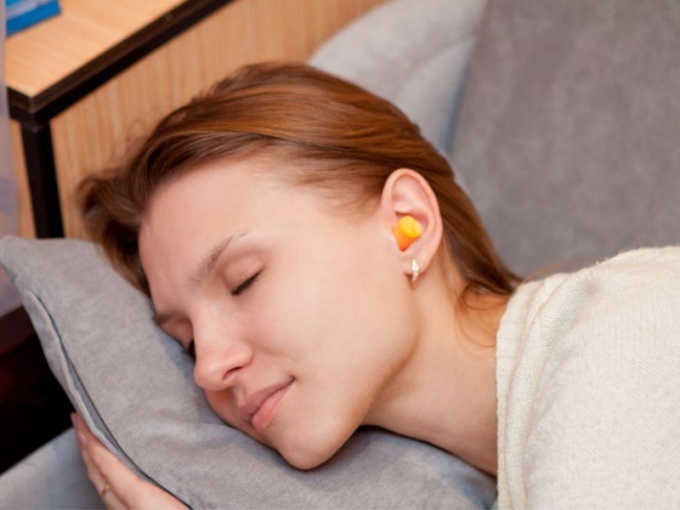 In General, the earplugs is a good way to protect yourself from industrial noise at work and provide a restful sleep at home or on the road. However, it is necessary to observe some rules in order not to harm your health. Sometimes people who frequently use ear plugs complain of the sensation of the air tubes in the ears and hearing loss. This is possible if the earplugs pushed into the auditory canal cerumen. To avoid this trouble, the ears should be cleaned from sulphur or wash with special means. Reusable earplugs should be washed thoroughly after use and keep in the packaging in which they were sold. If you violate the rules of hygiene, the risk of infection, to be treated from the effects of which will have a long time. Disposable ear plugs be wet because they lose their shape and become unusable. Too large of a tab ear can put pressure on the blood vessels inside the ear canal, causing blood circulation. A person experiences severe discomfort. About normal sleep, of course, you can forget. Do not get too often use earplugs, because there may come addictive. Even weak sounds will cause anxiety and will not sleep.